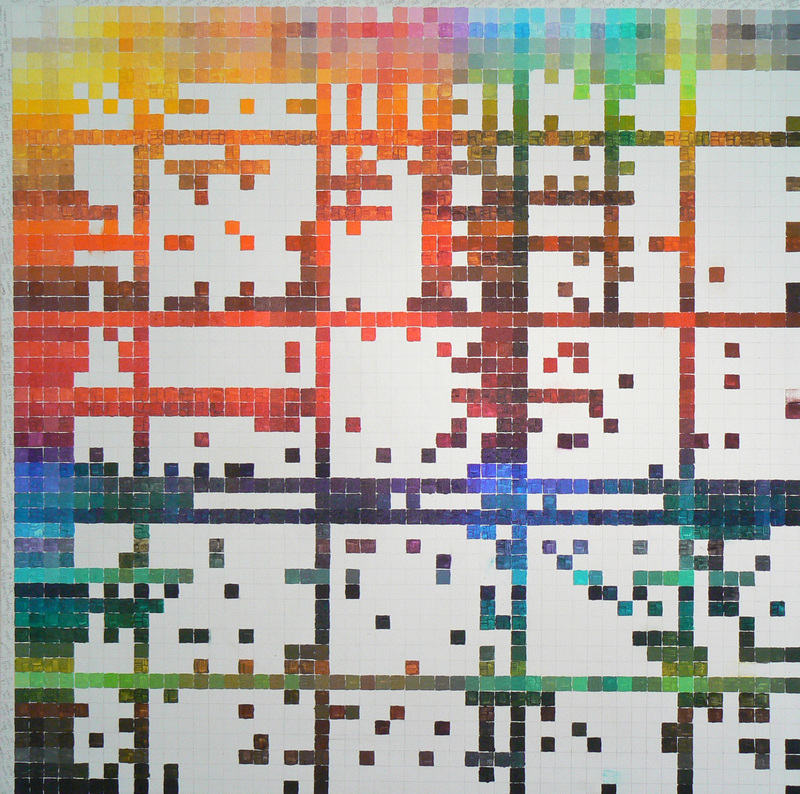 This is a color chart that I’ve been working on using Golden Heavy Body Acrylic colors. 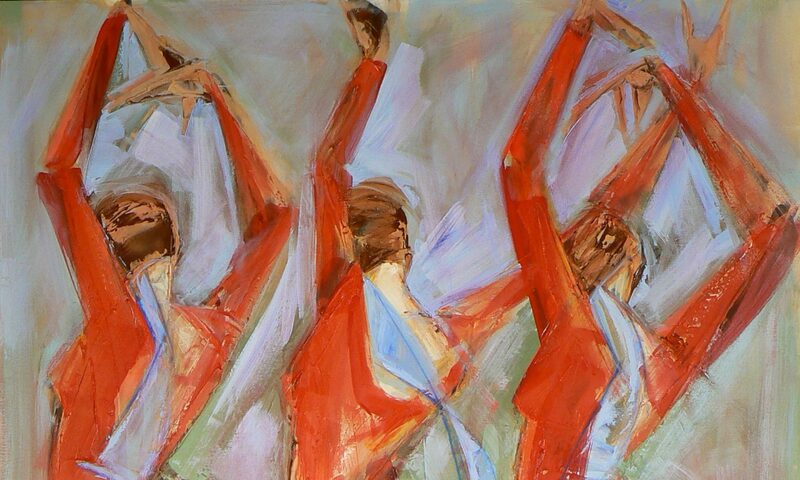 It is on a 40″x 40″ canvas. It’s tedious work and I have a ways to go to finish it. But I love what you learn as you mix two colors together, and then watch it change slightly as you mix the next variation of colors. 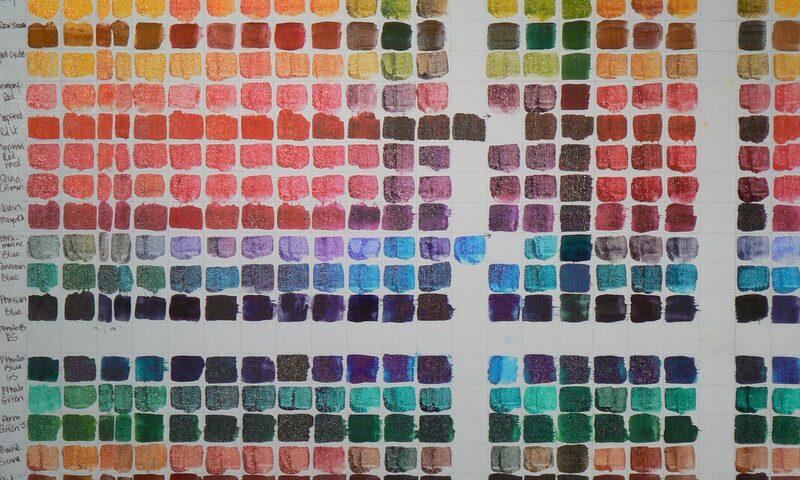 Of course I’ve learned a lot about color mixing by doing this chart but I’ve also repeatedly seen the difference in the properties of the colors. For example, quinacridones are very glossy colors as compared to cadmiums which are more matte. And you learn a lot about tinting strengths as well, pthalos mix up beautiful colors but it’s easy to overdue them in a mix. It goes on and on, and all the things I witness as I’m mixing I so easily forget, but it must be somewhere in the back of my brain. This is not a very scientific chart. There are no exact proportions. It is more based on where I can push a color by adding a little of this, or maybe a little more if it needs it to get that second color to make a difference in the mix. 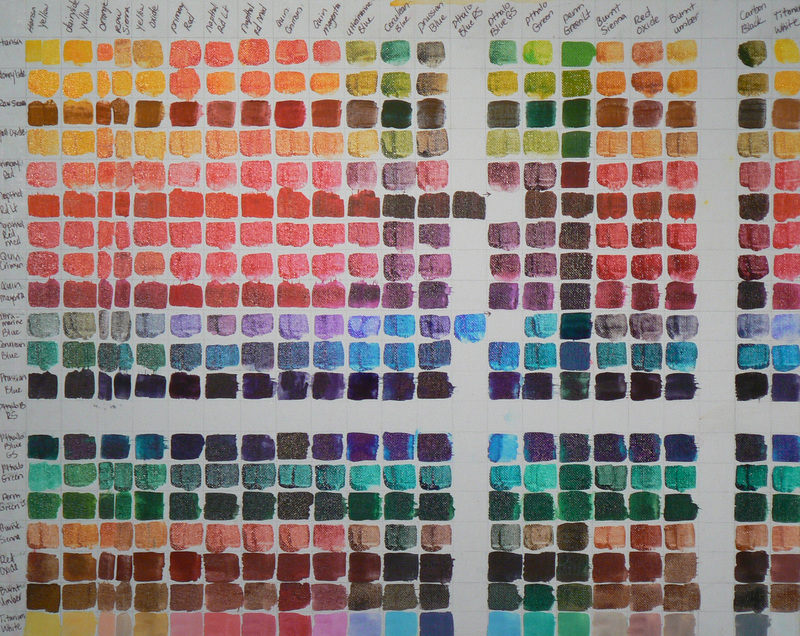 This is a color chart that I did with Createx Pure Pigments. I was trying to find ways to get colors that were highly saturated. Createx made pigments dispersed in water (which I don’t think are available anymore). It only takes a couple drops to create a richly colored paint. There are some pigment dispersion problems however, a little blotchy as it dries. Also, it is not permanent once dried so you cannot paint in layers and not have your colors bleed. If you add some acrylic mediums – this helps. I just love the color saturation. This is the first chart that I did when I switched to acrylic paint. There are a million mediums, especially when you work with Golden brand mediums. I work almost exclusively with Golden paints. And when you consider that you can start to combine mediums to customize your working properties – it’s mind boggling. This started to give me some idea of why I even want to work with more than one medium.